But there’s another thing that makes the 27-year-old rookie nicknamed La Tortuga is perhaps the most interesting man in baseball: his bat. No one in pro baseball hits quite like he does. Among all major league hitters in history to record at least 100 plate appearances, Astudillo ranks first in batting average (.382). While he looks something like Bartolo Colon, he’s hitting like Ty Cobb. In his brief major league career, he’s striking out at a 2.8 percent rate. Two players have had lower K rates for a season since 1989: Tony Gwynn (1995) and Felix Fermin (1993 and 1995). Astudillo has always hit. So why did it take him 10 years to make the major leagues? It’s probably that the sport didn’t know what to do with him. No one has looked, or hit, quite like the 5-foot-9, 225-pound catcher/utility man. The Twins’ scouts were perplexed by Astudillo, said Derek Falvey, the chief baseball officer for Minnesota. “He’s an interesting guy because he’s not someone projection systems would easily pick out,” Falvey said. “It’s a simple reason: Projection systems are based upon history. Take a random player, like Jonathan Schoop. You know what his track record was through the minor leagues. If you have a similar batted-ball profile, strikeout rate, swing-and-miss rate, all those things, there’s a chance you might become someone like him over time. That’s the way projection systems are built. They look at history to then look at the future. Astudillo is interesting for another reason, too: He’s getting better. Astudillo’s grandfather and father were obsessed with baseball. His father had played professionally in Venezuela. Astudillo remembers a drill in which his father would kneel a few feet away and flick corn kernels toward him in their backyard in the coastal city of Barcelona, Venezuela. Astudillo’s objective was to hit the knuckling projectiles with a broomstick. He thinks his rare contact ability is part nature and part nurture. 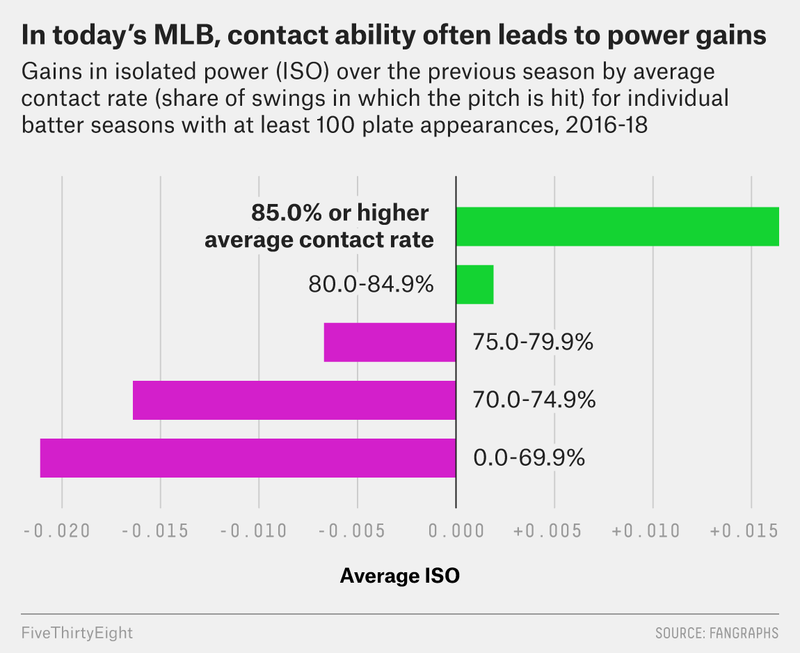 But low-strikeout, high-contact hitters are increasingly interesting for another reason beyond their scarcity: They’ve shown a knack for developing power. The average launch angle has increased every year since Statcast began measuring balls in play in 2015, from 10.1 degrees in 2015 to 11.7 degrees last season and to what would be a record rate of 13.2 degrees as it stands early this season. (Astudillo’s average launch angle was 12.2 degrees last season.) That trend suggests that more hitters are trying to hit balls above infield shifts and out of the ballpark. Hitters with excellent contact rates but unlikely power-hitting builds — like Jose Ramirez, Jose Altuve, Justin Turner, Mookie Betts and Francisco Lindor — have become sluggers in recent seasons. As more batters are adjusting their swing planes, elite contact hitters have made the greatest offensive gains — measured in one way by isolated power, or slugging percentage minus batting average. 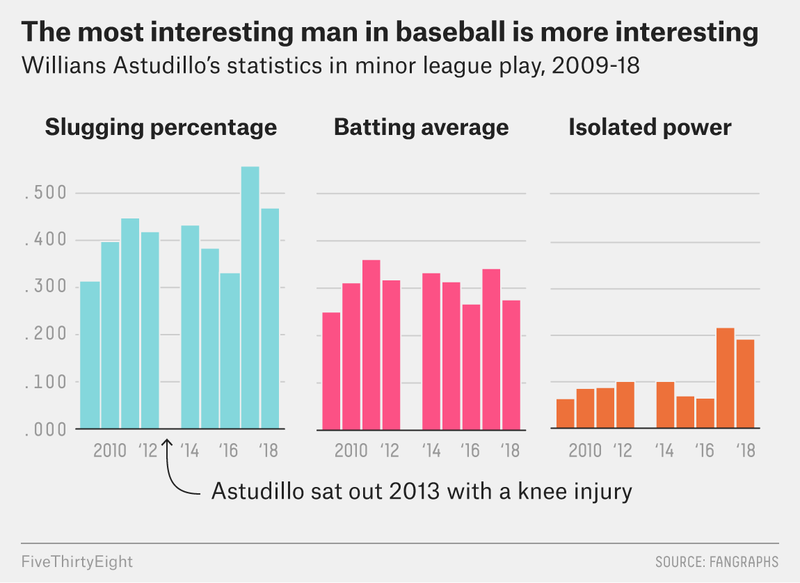 Astudillo has also gained power in recent years without having to sacrifice his contact ability. No projection system or scout saw that coming. Falvey, who had worked in the Cleveland front office before taking the Twins job, noted that Ramirez was also a high-contact hitter before he had an unlikely power breakout. While Astudillo was limited to 128 Triple-A plate appearances with the Diamondbacks in 2017, his isolated power jumped to a career-best .217, up from .065 the previous year. His previous best ISO mark had been .101. (The MLB average ISO was .161 in 2018.) With the Twins last year, he followed up with a .192 ISO mark in 307 plate appearances in Triple-A and a .161 mark in 97 plate appearances with the major league club. His power has been present early this season, too. Within his first three major league swings of 2019 on Sunday, he doubled twice. In his second start Wednesday, Astudillo went 3-for-5 with another double. Astudillo ranks 35th in the frequency of swinging at pitches out of the zone among major league hitters to have recorded at least 100 plate appearances since last season, and he ranks 17th in swing percentage. But Falvey noted that Astudillo doesn’t dramatically expand his zone and offer at pitches far outside the strike zone. When Astudillo goes outside the zone, he’s not going that far out of the zone. And when he swings — either in or out of the zone — he doesn’t miss. Astudillo leads baseball in contact rate (91.9 percent) and out-of-zone contact rate (83.3) among batters with at least 100 plate appearances since last season. That’s well above the MLB averages for both last season, with contact rate at 76.9 percent and out-of-zone contact at 60.1 percent. While Astudillo’s bat is fascinating, it’s not the reason the Twins signed him in November 2017 to a minor league contract with an invite to spring training. They were intrigued by his glove. During their organizational meetings last spring, Twins officials went through the scouting reports on players in their camp. As they looked at Astudillo, they thought he could play second, third, left field and catcher — important versatility in a sport that increasingly requires roster flexibility. A Twins evaluator in the room then spoke up. “‘He can play center, too, just ask him,’” Falvey recalled. The club officials were amused. Center field didn’t seem like a natural fit for the stout player. But Astudillo showed them the proof: video of himself robbing a home run in a 2014 Venezuelan winter league playoff game. Months later, after several Twins went down with heat exhaustion during a game on a sweltering afternoon last June, Astudillo trotted out to center field in Wrigley Field. He became the first player 5-foot-9 or shorter weighing more than 220 pounds to play center in a major league baseball game, according to Baseball-Reference.com. But even given his versatility, the Twins thought he was best suited to play catcher, according to Falvey. Astudillo rated as an above-average pitch framer throughout his minor league career, according to Baseball Prospectus defensive metrics — and pitch framing has been a focus of Falvey’s since he took the reins of the Twins after the 2016 season. While the Twins initially brought in Astudillo for his interesting glove, it’s his bat that will ultimately determine how much he plays and whether he’s a short-lived curiosity or becomes a useful major leaguer. Even the Twins admit that they didn’t see this player emerging. 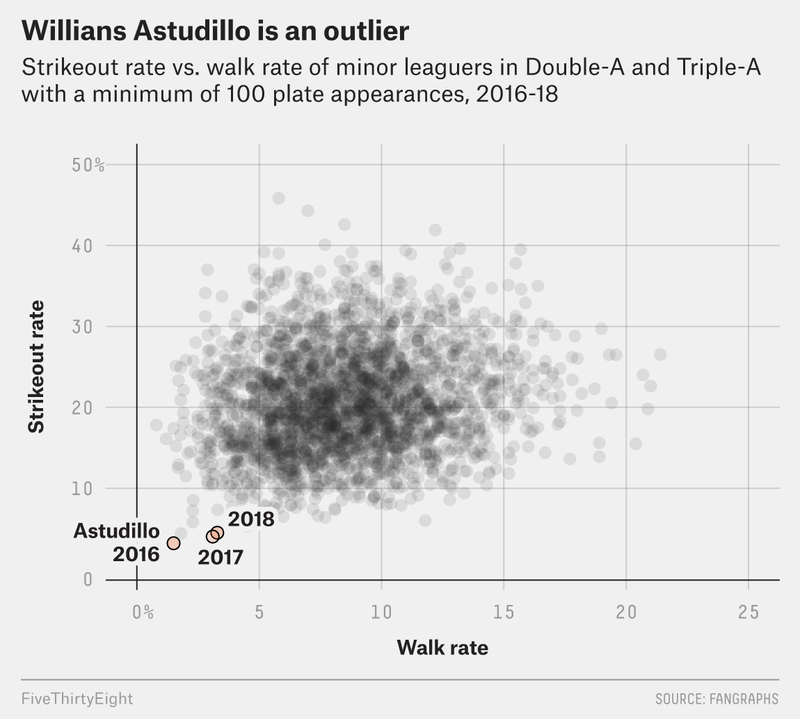 But as is so often the case with Astudillo, what you expect is not what you get. The best thing to happen to the Washington Nationals this offseason might be Bryce Harper turning down the $300 million contract offered by the club at the end of the season. Rather than allocating vast resources to one free agent superstar, the Nationals made smaller moves to shore up their weak spots, signing starting pitcher Patrick Corbin on Tuesday to bolster their rotation and adding two catchers earlier in the offseason. It wasn’t clear if the Nationals would be able to compete without Harper. But according to some forecasts, they are already better without him. They have improved themselves in a National League East where every team — save for the Miami Marlins — seems intent on trying to dramatically improve this offseason. After the Nationals finished 82-80 last season, FanGraphs projects them as the sixth-best team in the majors at the moment — the best team in the division — with a 91-71 forecasted record. While it’s unclear whether the Nationals still want to compete for Harper, they don’t need him to improve over last season. But even before signing Corbin, the Nationals had cheaply and significantly improved upon their weakest link. So it makes sense that the Nationals made upgrading their catcher group a priority in acquiring Yan Gomes in a trade with the Cleveland Indians last week and signing Kurt Suzuki to a two-year, $10 million deal in mid-November. At a time when catcher is the weakest offensive position in baseball (84 wRC+), Suzuki and Gomes are average performers compared with all hitters but virtual stars compared with the rest of the catching field. Suzuki posted a 108 wRC+ with the Braves last season (and a 127 mark in 2017). Gomes had a 101 wRC+ in Cleveland (on top of a 92 career mark). The players represent a major upgrade over Matt Wieters, who entered the past two seasons as the club’s primary catcher. Gomes, who will likely be the starter, is an above-average defender for his career. Consider the upgrade Gomes and Suzuki would have provided over the past two seasons. Nationals catchers combined for 0.5 WAR IN 640 plate appearances last year, according to FanGraphs. Gomes and Suzuki combined for 4.2 WAR (3.3 WAR when adjusted for 640 plate appearances). In 2017, Nationals catchers produced an MLB-worst -1.2 WAR. In 692 plate appearances in 2017, Gomez and Suzuki combined for 4.3 WAR. Catcher depth is key as the position requires more off days and the risk of injury is higher. For comparison, Harper has averaged 3.8 WAR over the past three seasons. Harper has superstar upside, but he could require a record contract commitment — and the Nationals have an outfield loaded with talent in Adam Eaton and young stars Juan Soto and Victor Robles. The Nationals are paying Suzuki a relatively modest $4 million in 2019, and Gomes is owed a club-friendly $7 million. In other words, the Nationals are paying a relative bargain if Gomes and Suzuki upgrade the position by 3 or more WAR, roughly what Harper has brought to the outfield in recent years. Without Harper, they had payroll flexibility to improve elsewhere. For every win above replacement, a player on the open market in 2017 could be expected to receive more than $10 million. By that measure, the Nationals have done well. With Corbin and the catcher upgrades, they project to have improved by 6 WAR at a cost of $34.3 million in 2019 when combining Gomes and Suzuki’s salaries with Corbin’s. The Nats are not the only NL East team to have filled voids. Josh Donaldson signed a one-year, $23 million deal with the Braves after averaging 3.2 WAR per season the past two years. The defending NL East champs elected to take on short-term risk to seek reward in adding the talented but injury-prone Donaldson. With the addition, the Braves strengthened one of their few weak links and now project to be average or better at every position except left field. The Phillies had too many weak links last season, ranking 22nd or worse in six position groups according to Baseball-Reference.com: shortstop, second base, third base, left field, center field and right field. They addressed arguably their weakest link entering 2019, shortstop — ranking 30th in WAR last year — in landing Jean Segura from the rebuilding Seattle Mariners. Segura averaged 4 WAR the past three seasons, according to FanGraphs, and is signed to a club-friendly five-year, $70 million deal through 2022, with a club option for 2023. (The Phillies also shed the contract of Carlos Santana in the deal and added bullpen arms Juan Nicasio and James Pazos.) Segura is a borderline star. The Phillies have cash to fill other voids, and they need to do just that to beat their 78 projected wins. They could use that cash on either Harper or Machado, both of whom have reportedly been in their sights. While Cano has aged well, he did turn 36 in October. He’s going to decline at some point. After receiving cash contributions from the Mariners, Van Wagenen — a former agent with no front office experience — gave a deal to Cano that amounts to a five-year, $60 million contract. Cano and elite reliever Edwin Diaz — who will upgrade a need area — cost the Mets dollars and two top 100 overall prospects in their No. 3 (Jarred Kelenic) and No. 4 ranked prospects (Justin Dunn) in the trade. The Mets ranked 20th or worse in the majors in production at catcher, first base, shortstop, third base and in their bullpen last season. The Mets didn’t need a star second baseman. They needed to strengthen their weakest links. With two outs and a man on base in the ninth inning Sunday, Alex Bregman grimaced after connecting on a Craig Kimbrel offering. He had just missed a game-tying homer, instead hitting a fly ball that fell into Andrew Benintendi’s glove on the warning track in front of the Green Monster for the final out. Game 2 of the American League Championship Series was over. The series was tied, and Fenway Park collectively breathed a huge sigh of relief. Even Bregman’s outs are increasing the heart rates of the opposition this October. Bregman became one of the best players in baseball during the season, and he’s elevated his game even further this postseason. Though in a small sample of just five postseason games, the 24-year-old has a .417/.708/1.000 slash line fueled by 10 walks (against one strikeout). He’s reached base in 18 of his 24 plate appearances this October. Bregman’s batting eye — along with opponents’ unwillingness to give him much to hit — is making some history. According to Major League Baseball research, Bregman is just the first player to draw 10 walks through five games of a postseason since Dodgers outfielder Jim Wynn did it in 1974. The only player before Bregman to draw at least three walks in back-to-back postseason games was Cubs outfielder Jimmy Sheckard — in 1910. Bregman, a spoil of tanking for the Houston Astros as the No. 2 overall pick in the 2015 draft, is getting something akin to the Barry Bonds treatment. Over his past three postseason games, the LSU product has drawn eight walks, matching Bonds in 2002 for the most by any hitter over a three-game span in postseason play. Bregman’s improved discipline is not just an October development: It’s what fueled his 2018 breakout. 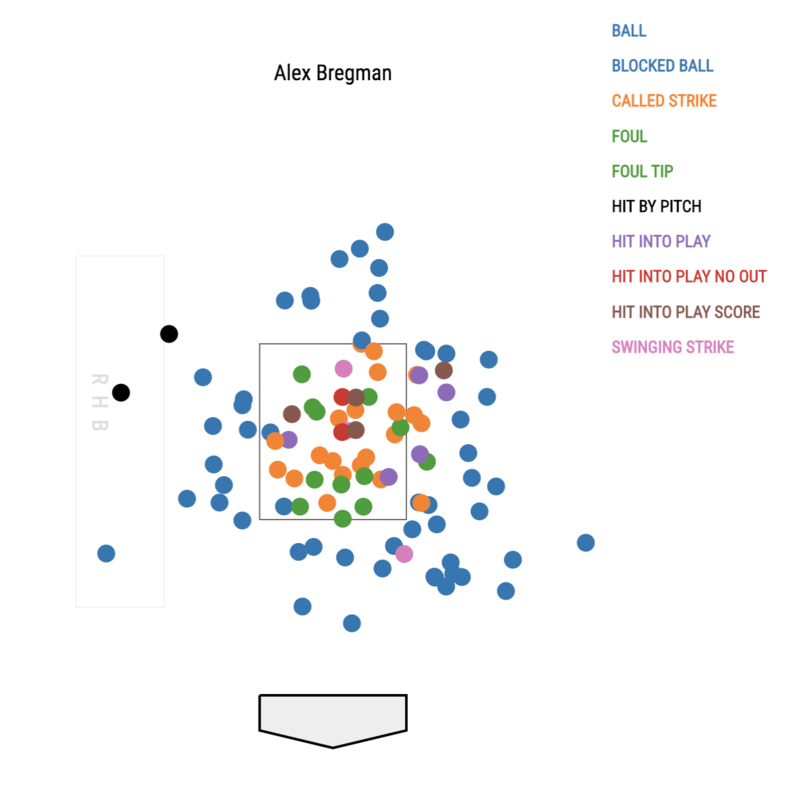 Only Joey Votto and Andrew McCutchen chased pitches out of the strike zone less often this season than did Bregman, who swung on just 18.1 percent of those pitches. Mookie Betts and Aaron Hicks ranked fourth and fifth. Bregman has improved his batting eye since reaching the majors in 2016. He dropped his out-of-zone swing rate by 5.8 percentage points from last season. Yasmani Grandal, Ian Happ and Gregory Polanco were the only players to make greater year-to-year improvements in laying off of balls out of the strike zone. “He’s having quite a season because of the preparation he’s doing, the lessons he’s learning, and the application in the game has been unreal,” Astros manager A.J. Hinch told the Houston Chronicle in September. While strikeouts continue to set record levels each year in the majors — from 21.6 percent of place appearances in 2017 to 22.3 percent in 2018 — the Astros posted the game’s lowest strikeout rate last season (17.3 percent) and the game’s highest slugging mark en route to a World Series title. This season, only the Cleveland Indians (18.9 percent) struck out less often than the Astros (19.5 percent). Bregman embodies this teamwide trend. The infielder is not just more selective in terms of swinging at pitches in the zone; he’s also finding pitches he can pull and drive for power. In 2018, he recorded just the sixth season this century of at least 30 home runs and 50 doubles with fewer strikeouts than walks. Bregman has always hit more balls in the air than on the ground. He ranked fifth this season in total volume of line drives and fly balls with 334. But he also increased his pull rate, perhaps encouraged by the inviting proximity of the Crawford Boxes at Minute Maid Park to the right-handed batter’s box. His quick hands and short arms allow for a short bat path. And by crowding the plate, he’s able to cover the entire zone and pull outside pitches. His 24 home runs hit to the pull side (left field for Bregman) tie for sixth in the majors. This is all before getting to other aspects of his game like his defense at third base, which has looked exemplary so far this postseason, giving the Astros two shortstop-quality defenders on the left side of the infield. The Astros didn’t know they needed another superstar, but they have one in Bregman, who is challenging Mike Trout and Mookie Betts for status as the best player in the American League. 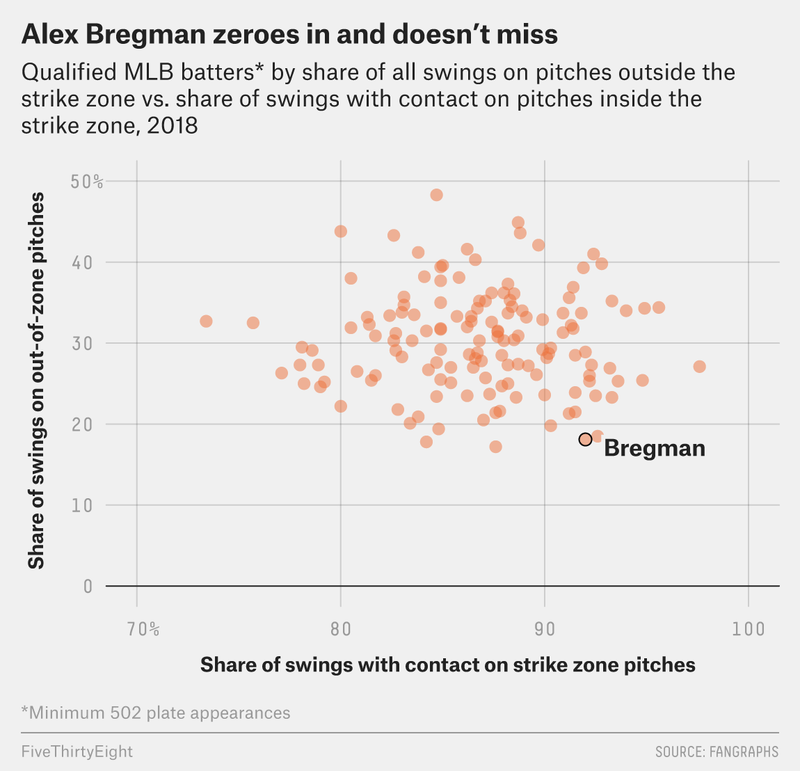 As the Astros battle for a World Series berth, Bregman might be the best player in baseball when it matters most. Winning the offseason — signing the marquee free agent and/or making the headline-grabbing trade — does not correlate strongly with actual winning. The San Diego Padres “won” the 2014-15 offseason by adding Craig Kimbrel, James Shields and a host of other players, then went on to lose 88 games the following season. The previous winter, Seattle shocked the baseball world by outbidding the Yankees for All-Star Robinson Cano, but the Mariners still haven’t made the playoffs since 2001. In December 2011, the Los Angeles Angels signed Albert Pujols to a 10-year, $240 million contract — a contract that quickly became one of the great albatrosses in the sport. The deal has compromised the Angels’ ability to improve their club; Angels star Mike Trout has participated in only three playoff games in his career. But last winter, something unusual happened: The Milwaukee Brewers won the offseason and went on to win in the actual season. The Brewers, who will begin the National League Championship Series against the Los Angeles Dodgers on Friday, acquired the best player in the trade market last winter in Christian Yelich and the best player in the free-agent market in Lorenzo Cain. They also found an undervalued arm in Jhoulys Chacin. These big-name acquisitions exceeded expectations. In total, no team had a better year-to-year roster overhaul than the Brewers — and it wasn’t close. The Brewers added 18.90 wins above replacement1 from outside their organization in 2018. The next closest teams were the Tampa Bay Rays (11.93 WAR) and Houston Astros (9.05). In terms of net gains and losses from last offseason, the Brewers’ departing players accounted for -0.02 WAR of value in 2018 with their new teams, making their net WAR gain from offseason transactions 18.92. The next closest clubs? The Red Sox (7.78) and Reds (5.43). Yelich (7.61 WAR), Cain (6.30) and Chacin (2.50) accounted for 39.7 percent of Milwaukee’s WAR this season. One reason it’s so difficult to translate offseason success to the actual playing field is that predicting player performance is a difficult task in just about every sport — even a sport rich in data like baseball. Injury and misfortune can derail the best of plans. Another reason is tied to a macro-level trend in baseball: Free agency has been devalued. Because of both performance and financial motivations, teams are prizing cheaper, younger talent more. The average age of an MLB player in 2004 hit a post-World War II high of 29.2, but that has gradually declined to a 21st-century low of 28.2 years this season. Testing for performance-enhancing drugs, which began in earnest in 2004, has also likely played a role in the disappearance of 30-somethings — ages when players are typically acquired as free agents. Simply put, it’s more difficult to buy a competitive team in baseball, while the Chicago Cubs and Houston Astros have won titles with homegrown efforts and given MLB a blueprint in the past several seasons. Yet Milwaukee defied the odds and — partially through spending — got itself a contending team. As the industry zigged, the Brewers zagged. Conventional wisdom has it that small-market baseball teams must be homegrown because there is no financial mechanism like a salary cap to level the playing field, though baseball’s strengthened penalties for exceeding the luxury tax are acting something like a soft cap.2 But the Brewers, ranking 23rd in opening day payroll, had the second lowest amount of homegrown production this season, according to MLB.com’s Mike Petriello, who found that only the Oakland A’s had a lower share of homegrown WAR than the Brewers’ mark of 17 percent. The Brewers’ offseason and in-season success is tied to being opportunistic. The team took advantage of a suppressed free-agent market to land Cain, an effort perhaps aided by clubs saving dollars to pursue Bryce Harper and Manny Machado this coming offseason. Star-level free agents often sign before New Year’s Day, but it wasn’t until late January that Cain reached a five-year agreement worth $80 million. While the back end of the deal might not turn out to be favorable for the club, the 32-year-old Cain’s 6.3-win season has already covered much of the expense in terms of performance value. Among 2017-18 free agents, no one was more valuable than Cain this season — even J.D. Martinez, who is guaranteed $30 million more over five years. While teams have become more leery of free agency, they’ve also become less likely to part with prospect talent. Milwaukee went against the grain here, too, in acquiring Yelich, who may very well be the NL MVP. The Brewers surrendered four prospects — including their top prospect, Lewis Brinson — to acquire Yelich. The 26-year-old is under club control through the 2022 season at $51.3 million. All clubs are interested in free-agent bargain hunting to fill out their rosters — and the Brewers did well here, too, in signing Chacin to a two-year, $15.5 million deal. Chacin’s 2.50 WAR was third only to Miles Mikolas (4.47 WAR)3 and Jake Arrieta (2.65 WAR) among free-agent starting pitchers signed over the winter. With the Brewers, Chacin and Yelich have gotten more out of their abilities. Chacin’s slider usage rate has increased to a career-high 43.9 percent; in run value per 100 pitches, it was the 11th-best slider in baseball. Yelich became more aggressive in swinging in early counts in the second half, and his home run-to-fly ball rate surged to 48.1 percent. The Brewers were also able to avoid the overpriced relief market, returning Josh Hader and Corey Knebel — their top two relievers from 2017. Their bullpen is the strength of their pitching staff. Milwaukee invested wisely. The Brewers saw undervalued players and opportunity last winter. Because of that, this high-import, small-budget team is four wins from the World Series.